BEIJING, China (CNN) -- A Chinese man wielding a knife stabbed an American couple in central Beijing on Saturday, killing the man and seriously wounding the woman before jumping to his death from an ancient tower, said U.S. Olympic officials and state-run media. Todd Bachman, seen in a 1995 photo from KARE-TV, was stabbed to death Saturday in Beijing, China. A female Chinese tour guide also was wounded in the attack, which happened around noon at the Drum Tower, a popular tourist site, China's official news agency, Xinhua, reported. 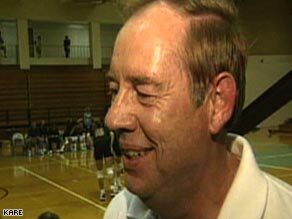 The U.S. Olympic Committee identified the dead man as Todd Bachman, the father-in-law of Olympic Men's Indoor Volleyball Head Coach Hugh McCutcheon. Bachman's wife, Barbara, suffered "serious and life-threatening" injuries, the committee said. However, Xinhua reported that she and the tour guide were in "stable" condition at a hospital. Dale Bachman, second cousin to Todd, said that Barbara Bachman had made it through surgery Saturday and was being treated in intensive care at a Beijing hospital. "The next 24 hours are critical and we appreciate all your thoughts and prayers," he said. The Bachmans were not wearing apparel that identified them as relatives of members of the U.S. delegation at the time of the attack, USOC said. Dale Bachman said the family has been "simply overwhelmed" by an outpouring of support and sympathy from across the globe since news of the attack broke. "The U.S. Olympic family is another family for Todd and Barbara," he said. "They were very excited about making this trip to China. One of the messages that came back was to a friend of Todd's, an e-mail after the opening ceremonies letting her know that Todd had seen the opening ceremonies and enjoyed them and was inspired by them." "It is impossible to describe the depth of our sadness and shock in this tragic hour," USOC Chairman Peter Ueberroth said. "Our delegation comes to the Games as a family, and when one member of our family suffers a loss, we all grieve with them. Our thoughts, prayers and deepest condolences are with the Bachman and McCutcheon families." President Bush, who is in Beijing for the Games, said in a statement that he and the first lady were "saddened" by the attack. "Our thoughts and prayers are with the victims and their families. And the United States government has offered to provide any assistance the family needs," Bush said. The U.S. Embassy has offered the victims' families whatever assistance is needed, a White House spokesman said. The ancient Drum Tower and the nearby Bell Tower are popular tourist sites. Both sites told the time in the capital city, with the bell rung in the morning and drum beaten in the evening, throughout the Yuan, Ming and Qing dynasties.